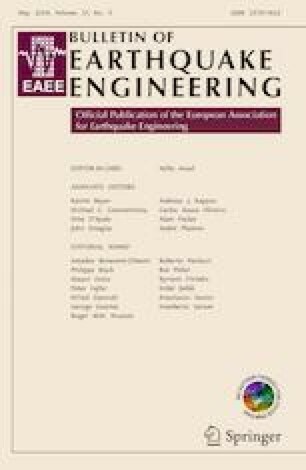 In this paper, unreinforced masonry (URM) and retrofitted masonry walls are modeled experimentally and computationally. The walls were subjected to in-plane loading to assess on the effectiveness of a retrofit solution that makes use of near surface mounted (NSM) reinforcing steel bars. A laboratory testing campaign was performed that included pull-out tests, diagonal compression tests, and in-plane cyclic tests of URM and NSM retrofitted physical models. The experimental results indicate that the NSM reinforcing steel bars are effective in improving the deformation capacity of the URM walls. A computational modeling approach that makes use of the applied element method is proposed and the computational results are validated using the experimental tests presented. Results from computational models indicate that a good correlation with the test results is achieved in terms of load-displacement response as well as failure mechanisms observed. The authors would like to acknowledge the support of Cascadia Lifelines Program (CLiP) based at Oregon State University and additional funding provided by Bonneville Power Administration (BPA) for the laboratory testing and discussions with Dr. Leon Kempner. Additional support was provided by the Kearney Faculty Scholar Endowment fund. The authors are grateful to Applied Science International (ASI) for implementing the material models used here in the version 5.0 of ELS and the valuable discussions on AEM modeling with Dr. Hatem Tagel-Din and Dr. Ahmed Amir Khalil. The opinions and conclusions presented in this paper are those of the authors and do not necessarily reflect the views of the sponsoring organizations.